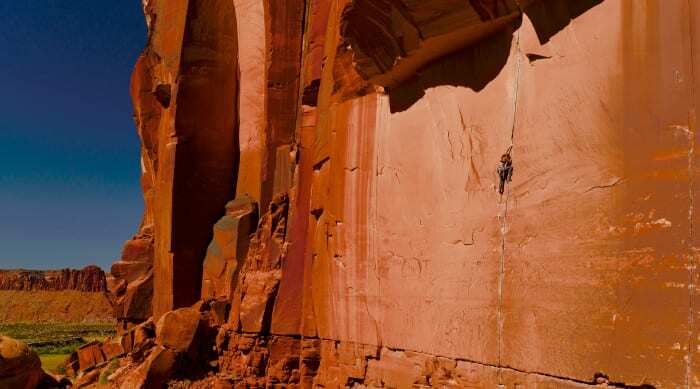 Moab is world renown for its crack climbing. The seventies brought legends like Earl Wiggins, Charlie Fowler, Jay Smith and Kyle Copeland to Moab when it was just a speck of dust on Highway 6 after the uranium boom. These climbers wasted no time and developed routes that are still todays “Moab Classic Crack Climbs.” Do you have your own hit list? If not we can assess your ability and put one together for you! 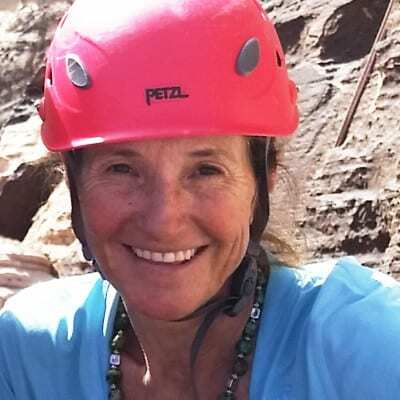 A day with one of our experienced desert guides will get you to the climb faster and get you on your way to experiencing a piece of American climbing history. The Moab crack climbs of yesterday are still the standard today. 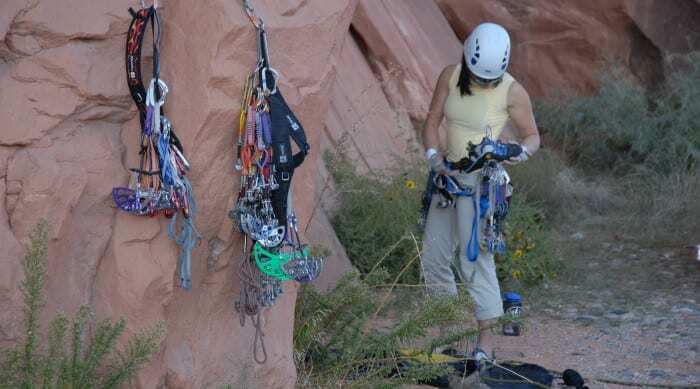 Grab your gear and one of our guides and spend an unforgettable day climbing world famous outside of Moab. Follow your guide from the Red Rock Bakery to the climbing area. 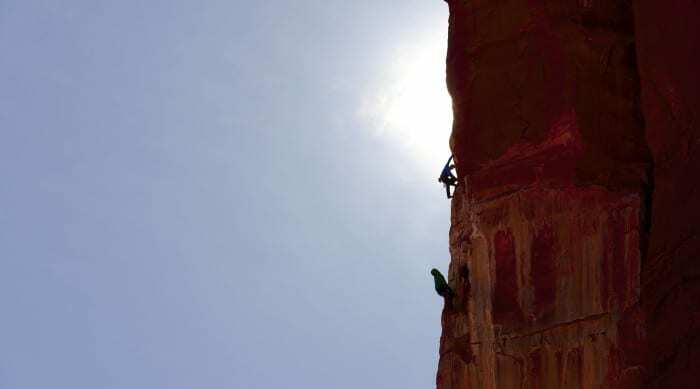 From there you will work on improving your traditional climbing skills on the most iconic crack climbs in the Moab area. JHMG basic rock class or other climbing experience. Knowledge of basic climbing knots and hitches. Group pricing is for 2 people on a trip. Please click here to inquire about specific dates or private trips. Unless other arrangements have been made, trips leave from the RED ROCK BAKERY, 74 South Main Street across the street from the Mc Stiff’s Plaza. You will follow your guide to one of the many climbing sites are close to town. Be prepared to climb athletic routes. 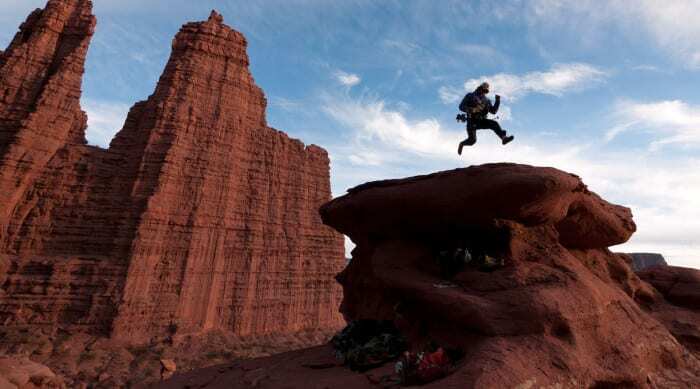 There are warm up routes to get familiar with the unique sandstone features of Moab. Come with an open mind and understand that the grade you climb in the gym or your local crag has little relevance in the Moab area. I climb 5.10 in the gym. What should I expect with the crack climbing grades in the Moab area? Know that you have a good foundation if you are training and spending time climbing in the gym or other sport climbing areas. Do KNOW that you need to throw out any ratings from sport climbing and the gym when you step outside into the world of crack climbing. Crack climbing in Moab is it's own beast. The routes are sustained and strenuous. The is no correlation between gym route grades and Moab climbing. You need to show up with an open mind for learning a new climbing technique. Crack climbing sounds hard. Will I be able to do it? Crack climbing is a different learning curve than face climbing. Think of climbing like swimming. You can swim but can you do the butterfly? 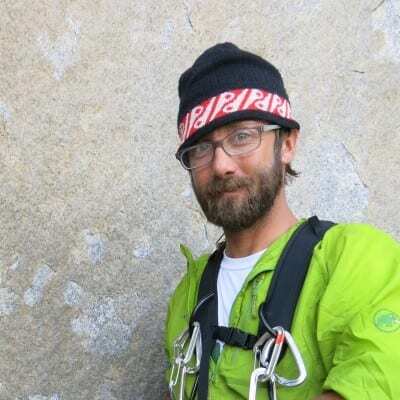 Crack climbing is it's own discipline of climbing that can be mastered with an open mind and a little time with the guidance of one of our experienced guides. Why Should I go with JHMG? We always say that there are times to be budget conscious and times when you want the best. Things like surgery, sky diving lessons and mountain/rock climbing are times when you really don't want to be looking for a bargain. But if you are looking for an adventure of a lifetime, with a well trained, certified and experienced guide service, you found one in JHMG. But these are just words. What sets us apart and what should you be looking for in a guide service? Good question, I am glad you asked. First off. JHMG is the second oldest guiding service in the US. We have 48 Years of experience, which means that we have had time to refine our client processes, risk management procedures and have emerged a well-oiled machine, that knows how to provide a high level of service and do it safely. Second, JHMG is a National Park Service concessioner. Our National Park Service is unscrupulous at vetting it's concessioners. Not only do they pay close attention to our operations, but require visibility into our finances, insurance, hiring practices, environmental management practices, risk management practices and our customer satisfaction. In short. We are required to run a very tight ship and we go under review EVERY YEAR!!!! We welcome this scrutiny as an opportunity to make us better, and we apply this same high level of operation to every location we operate in. So you don't just have to take our word for it, the National Park Service stands behind our integrity as a company. In the end however, we are a company of passionate people who live and breath adventure. We understand that to be the best, we need to seek out the best people and offer them a home and a professional opportunity. All JHMG guides are employees, not subcontractors. They have retirement accounts, workers comp and are paid as professionals. JHMG is also accredited by the American Mountain Guides Association. 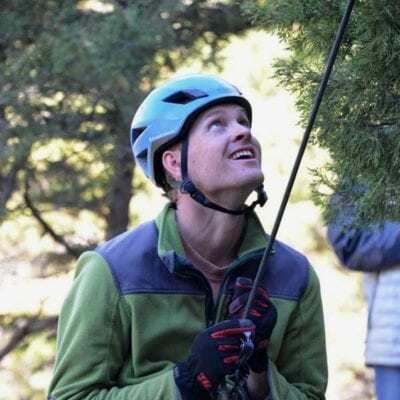 Which means that our guides are not only vetted by an AMGA certified guide, but many undergo rigorous certification by a this third party organization in the discipline that they guide. But risk is a part of what we do. So it is important that in the event of an incident, that our guides are capable of delivering a high level of care. This is why all certified guides at JHMG are required to have at least Wilderness First Responder Medical training and many of our guides have gone on to get higher levels of medical training like Outdoor Emergency Care (OEC). I hope that the picture that is being painted is one of a professional, experienced and well trained guiding company. But what about customer service? We know that your time is precious, and we appreciate that you have a choice in how you spend that time. That is why we take customer service very seriously. From the moment you contact us, you will be treated with respect and professionalism. Not just by our guides, but by the number of people who work behind the scenes to make sure that your adventure goes off without a hitch. We can't control the weather, but we endeavor to make your experience everything you want it to be. So, if you are looking for a inexpensive guiding service for a one off adventure, we are probably not a great fit. 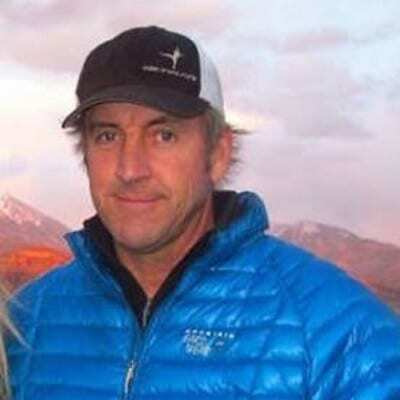 But if you want a professional, experienced team of people who will work hard to give you the experience of a lifetime, then look no further than Jackson Hole Mountain Guides. JHMG provides a total package experience for all level of adventures. I highly recommend them for an awesome and safe vacation.